RIC 211 (Elagabalus), S 7655 Denarius Obv: IVLIAPAVLAAVG - Draped bust right. Rev: CONCORDIA - Concordia seated left, holding patera; star in left field. 219-220 (Rome). RIC 214 (Elagabalus), BMC 318 (Elagabalus) Denarius Obv: IVLIAPAVLAAVG - Draped bust right. 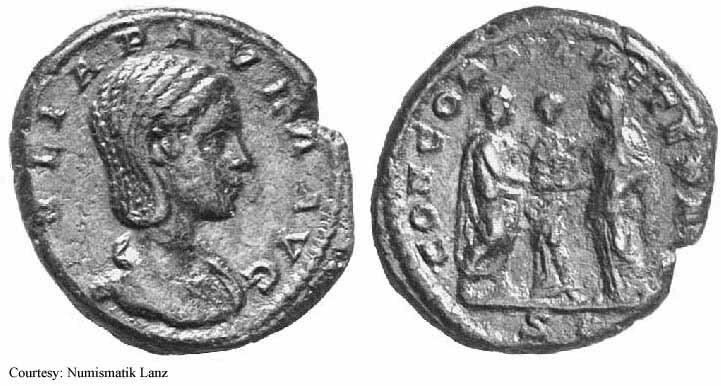 Rev: CONCORDIA - Julia Paula standing left on right, shaking hands with Elagabalus to left. 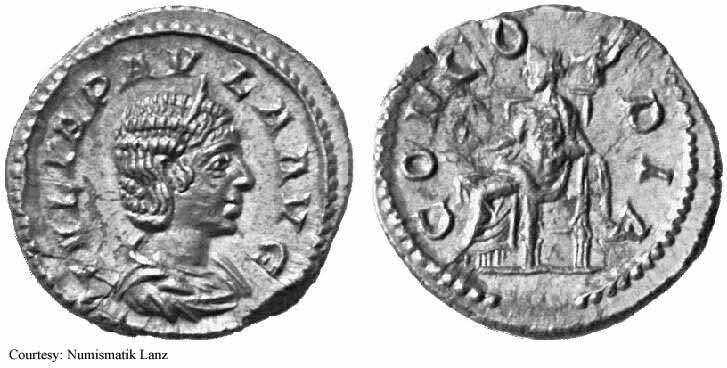 RIC 216 (Elagabalus), C 16a Denarius Obv: IVLIAPAVLAAVG - Draped bust right. 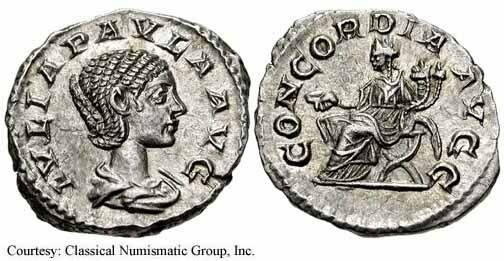 Rev: CONCORDIAAVGG - Concordia seated left, holding patera and two cornucopiae. RIC 222 (Elagabalus), S 7658, C 21 Denarius Obv: IVLIAPAVLAAVG - Draped bust right. Rev: VENVSGENETRIX - Venus seated left, holding globe and scepter. 219-220 (Rome). 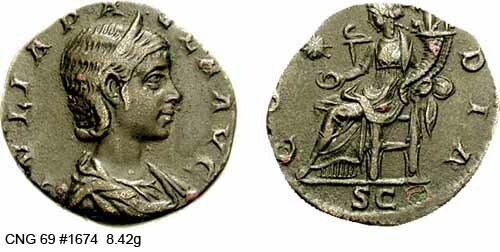 RIC 213 (Elagabalus), BMC 176 Quinarius Obv: IVLIAPAVLAAVG - Diademed, draped bust right. Rev: CONCORDIA - Concordia seated left, holding patera. 219-220 (Rome). $1,564 11/20/00. RIC 381 (Elagabalus), BMC 415, C 8 Sestertius Obv: IVLIAPAVLAAVG - Draped bust right. 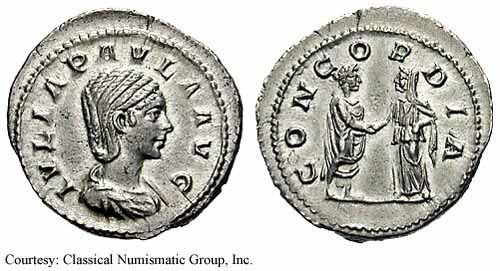 Rev: CONCORDIA Exe: SC - Concordia seated left, holding patera and two cornucopiae; star in left field. 220 (Rome). 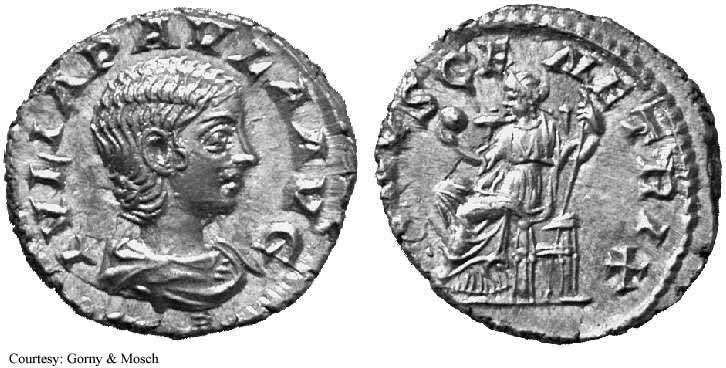 RIC 385 (Elagabalus), C 11 As Obv: IVLIAPAVLAAVG - Draped bust right. 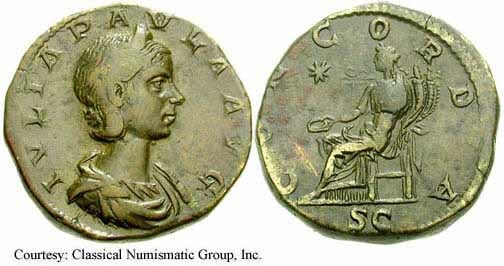 Rev: CONCORDIA Exe: SC - Concordia seated left, holding patera and two cornucopiae; star to left. 220 (Rome). RIC 387 (Elagabalus), BMC 423, C 15 As Obv: IVLIAPAVLAAVG - Draped bust right. Rev: CONCORDIAAETERNA Exe: SC - Julia Paula standing left on right, shaking hands with Elagabalus to left; Concordia standing in between. 219-220 (Rome). $326 11/20/00.